Subject: Fw: View attachment reason for payment 0f USS$250,000. TINUBU SQUARE, P.M.B 12194, LAGOS-NIGERIA . 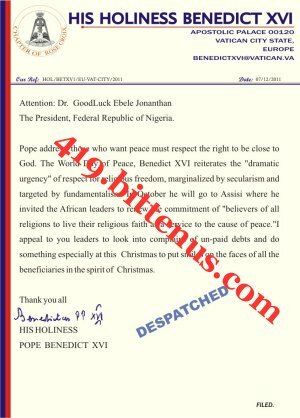 In the spirit of Xmas which Pope preached, we have been directed to issue Internationalirrevocable bank drafts to the tune of USS$250,000 to each of the beneficiaries as as interest accrued to the approved sum of USS$10.5 million owed to you. Therefore, you are required to send names to written on your own draft, address for postage, direct telephone numbers and the sum of $92 for courier cost or $48 for registration surface posting. Since our corrispondence banks, Bank of America, Lloyds, Canadian Trust and HSBC have made their services ready for the project, we will not have any cause to delay getting the draft accross to within 3days period. You are therefore to inform us the method of delivery/postage you have choosen so that we can give you where to payment should be made to.